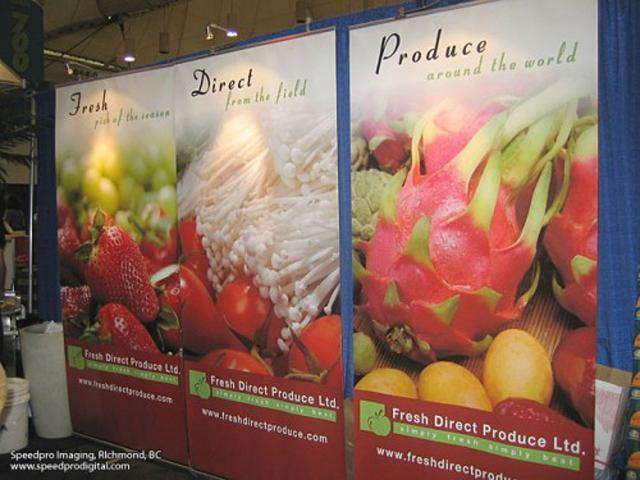 If you’re looking to showcase your products or services on the road, having a dependable and portable trade show display will help garner attention from potential customers, employees and partners. At SpeedPro Imaging Pittsburgh North, we serve the entirety of the Steel City, as well as all of Allegheny and Butler counties. Our devoted and knowledgeable staff is ready to tackle the requirements of your business. We’ll introduce you to our extensive catalog of products and services, and together we will find the ideal set of graphics to push your marketing strategy to the next level. There’s no better way to get noticed at your next expo, festival or job fair than with a collection of high-quality products and accessories from the nation’s leading large format graphics provider. 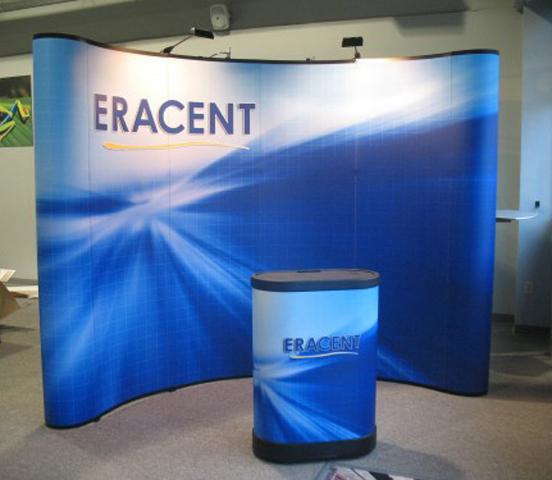 We’ll create a pop-up trade show display that’s durable yet lightweight and bold yet professional. Banner stands: Banners are a classic way to capture the fleeting glances of event attendees, and retractable stands offer a way to bring them wherever you go. Our stands come in a variety of sizes, styles and quality levels. 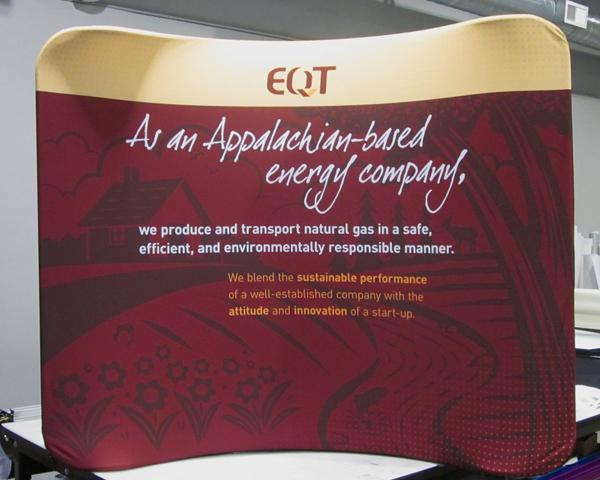 We can make tabletop stands that are a few inches tall, or you can go with a huge model to use as a trade show backdrop. Style-wise, you can choose from retractable, telescopic and spring-back stands. We offer three types: economy, standard and premium. 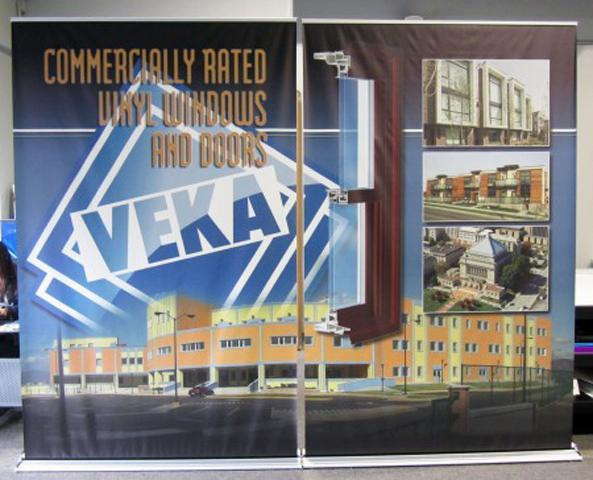 Pop ups: Pop ups display large print fabric graphics, and they can be placed in a variety of locations for flexibility. You don’t need any tools to set up these lightweight kits, which also come with their own carrying cases — they make excellent traveling buddies! Point of purchase (POP) displays: Our POP displays are another flexible option that serves a multitude of purposes. Display information and products while pushing your brand message. We offer sectional fabric wall panels, monitor stands, attachable shelving, kiosks and more. Backlit displays: Our backlit displays help your brand look sharp and clever at trade shows Backlit displays use a rugged frame and LED lamps to light up a fabric graphic overlay. Use the frame and lights over and over again but get a new look by replacing the fabric graphic cover. We also offer tents, flags and a variety of outdoor signage to use if you’re taking your display outside. No matter what, your trade show display booths and corresponding accessories will offer stress-free setup and tear down, with many of our products capable of converting in just a few minutes. Once you step into our studio, we’ll do what we can to ensure that your experience is collaborative, fluid and, most importantly, stress-free! Contact us today to schedule your consultation. You can also come by our studio, which is located on Commerce Park Drive in Cranberry Township.